Don Giovanni is a work which sees Mozart at his most confident and, dare it be said, his most mischievous. Reassured no doubt that his work would be well received in what had become his adoptive city, Prague, following the success the previous year of The Marriage of Figaro, it is enticing to assume that Mozart’s own categorisation of Don Giovanni as a dramma giocoso, literally a drama with jokes, was intended to ensure that there would be shocks aplenty when it was premiered at Prague’s National Theatre on 29 October 1787. Don Giovanni is an incorrigible womaniser. His pursuit of Donna Anna, at the very start of the opera, results in her father’s death by his own hand. Despite this, Don Giovanni continues to chase other women, even with the storm clouds gathering around him as Donna Anna, her brother Ottavio, and his former lover Elvira seek to unmask him and exact revenge. In the process, he risks his own life as well as the life of his manservant, the long-suffering yet faithful Leporello. Yes, the plot provides many laughs, particularly the scenes in which Giovanni and Leporello trade places in an attempt to outwit those around them, but today we would be more likely to see Don Giovanni as typifying the spirit of Grand Guignol, even though the French theatre which brought the term to us was not to open until a century later. From the solemn tones of its D Minor overture through to the opera’s spine tingling denouement, Don Giovanni is a piece which quite literally has the power to take one’s breath away: first we are left aghast at the libertine’s complete disregard for the consequences of his escapades; then we can barely take in Mozart’s quite astonishing staging of Giovanni’s end as he is condemned to hell, as much for his attitude of mind as for his actions. 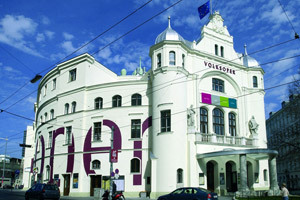 The Volksoper Vienna - the Vienna People’s Opera - began its life as a play theatre. It was built hurriedly in 1898 to celebrate Kaiser Franz Joseph’s Golden Jubilee, but as a business became bankrupt five years later. Under its new director, Rainer Simons, opera proved to be its salvation: the first Viennese performances of Giacomo Puccini’s Tosca and Richard Strauss’ Salome were given there. Today, the Volksoper plays to packed audiences throughout the year.